Honorary von Fritsch opened the meeting with a curious story of a German lumberjack who, roughly 200 years ago, wrote a book on the guidance and preservation of a forest habitat that lay at the time in the west of the Russian Empire. This book, as the German ambassador noted, was the first example of ecological cooperation between Germany and Russia. Today, of course, this cooperation is both wider and deeper. It touches on questions of preserving the forest and surrounding area, as well as protecting the climate and safe handling of industrial waste. Two documents serve as the basis of this cooperation, the first being the 1992 Intergovernmental Agreement and Statement on the Implementation of Joint Projects on Environmental Protection in Russia 2017-2019, signed last summer by the head of the Ministry of Natural Resources and Environment and by the head of Germany’s Federal Ministry of the Environment, Nature Conservation, Building and Nuclear Safety. We are already cooperating for the preservation of wetland habitats in Moscow, Nizhegorodsk, Tversk, and Vladimirsk oblasts, as well as the forests of the far east and nature reserves in the Russian north. The German side is already consulting us in regards to legal, technical and financial questions of introducing the best available technology in companies, is developing study programs and is conducting training courses for representatives of environmental protection agencies. German companies are achieving modern solutions for the use of alternative fuel and non-traditional raw materials, such as cement production. Indeed, our country is beginning to treat matters of ecology more and more seriously, especially given that in the time of the Soviet Union little attention was paid to these problems. «During the USSR they did not treat the ecology very carefully,” as Matthias Shepp, representative of the Russian-German Foreign Trade Chamber, diplomatically said. Mr. Shepp recalled how, for example, when he worked in Russia as a correspondent for Stern in the 1990’s, he wrote about ecological catastrophes across the country. Now, however, the situation is changing, and Russia is beginning to change its approach to environmental preservation. “In comparison to the 90‘s, the air in Moscow has gotten better,” Mr. Stern noted. It should not be surprising, therefore, that Russia declared last year to be the “Year of Ecology.’’According to Nuritdin Inamov, Director of the Department of International Cooperation of the Ministry of Natural Resources and Ecology of Russia, the “Year of Ecology” was not just a formality. Over the course of the year, more than 20 million people took part in various events centered on ecological education, and new laws on the implementation of new technologies in factories were adopted, which considerably increased the fines for violations. If before a similar fine accounted for all of 90,000 rubles, then as of January 2019 the fine would rise by a 100 times. In addition, the basis for this law in Russia was in a similar law adopted in Germany in 1973. Russia finally recognizes that without solving ecological issues, the development of business in the country will be impossible, and, if one takes a broader look at the problem, then the modern development of the country will also be impossible. A good example of this is served by German companies working in Russia. Currently, there are more than five thousand such companies. Roughly 300 thousand peoples work in these companies. Arriving to Russia and localizing their production here, German companies are not only teaching us how to make quality production, but are also bringing a refined ecological culture to our country from which we can also learn. This is already taking place in particular in Kaluga, where German business is especially broadly represented. Currently there are 20 businesses from Germany working there, and around 10 joint Russian-German business in which 7.5 thousand people in total are working. As Varvara Antokhina, Minister of Ecology and Natural Resources for Kaluga Oblast, confessed, it is thanks to the activity of German businesses there that a culture of ecology is being formed. However, as Russian participants at the German ambassador’s residence noted, learning about ecological culture is not something that just Russian businessmen should do, but also the whole of Russian society. In Germany itself learning about ecology begins in kindergarten. In other words, in order to achieve the necessary effect, government, business, and society need to take part in protecting the environment. In this sense, Russia is only at the beginning of the journey. As just one example, if in Germany, as in many other countries in Europe and America, people have known for quite some time about separating waste for recycling, then many citizens in Russia could not even conceive of this, and yet another majority of citizens is even against such a way of recycling waste! As such, the following numbers should not come as a surprise. If in Germany recycling accounts for 90% of waste, then in Russia it is all of 5%. According to official statistics which Anton Kulbachevsky, head of the Department of Nature Management and Environmental Protection of Moscow, only 30% (!) are prepared to see special trash disposal bins for glass, plastic, and paper appear in the entranceways to their buildings and in the city’s courtyards. This is most likely not surprising, given that Moscow authorities began actively instilling this idea amongst the population only in 2011. Ever since, they have been energetically spreading this idea in schools, and in higher education. In the end of 2015 the capital city’s authorities released an interactive map of separated waste collection points and recycling receptacles. It tells where to throw out used batteries, plastics, and scrap paper. As such, Muscovites can see online where to get rid of used batteries, aluminum cans, energy-saving lamps, scrap paper, plastic, glass, electronics, black and non-ferrous metals, and car tires. 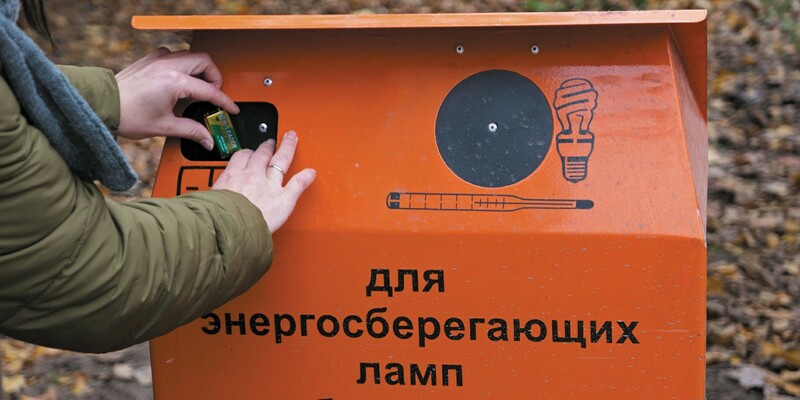 According to information from the city’s Department of Nature Management and Environmental Protection of Moscow, the most numerous locations in the capital are energy-saving lamp disposal sites. These lamps need to be disposed of properly if they contain mercury. For the most part, regional Housing and Communal Services branches take accept them. 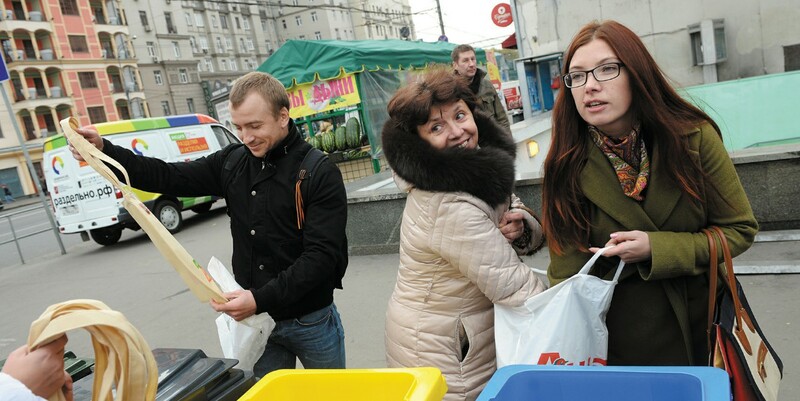 There are also more than 50 recycling points working in Moscow which are in almost every city district. In regards to separate garbage collection points, there are roughly 30. So far separate garbage collections points are present in three city districts – the Northern, North Eastern, and South Western districts. There are also 30 mobile points of separate garbage collections in the north of the city. These are special cars with containers which run on schedule between regions, stopping at different points for 15 minutes. The schedule is also available on the interactive map. There are special containers at these stations into which the following sorted trash can be thrown: scrap paper, plastic, aluminum banks, glass, and batteries. The Moscow government is developing an ecology strategy for before 2030. Before this time, apparently, the trash separation system will start fully working. The problem is that, aside from separate garbage collection, the city also needs to create broad infrastructure for processing recycling, which, as it stands, does not currently exist. There is only the rather shabby infrastructure from the Soviet Union, when the population was called upon to hand over scrap metal, paper, and cardboard. After doing so, they received in turn works of fiction which were scarce at the time.